Seymur Ahad oglu Ramazanov – Head of ICT Department of Azerbaijan Cooperation University. Seymour Ahad oglu Ramazanov was born on March 11, 1996 in Baku. 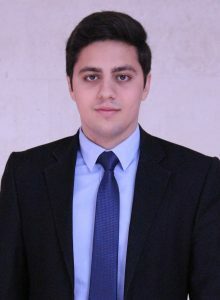 In 2013, he graduated from the humanitarian disciplines gymnasium named after S. Pishavari, in which he entered the Finance specialty of the Finance Department of the Azerbaijan University of Cooperatives. In 2017, she graduated with honors. In 2017, he entered the Master of Business Administration of the Azerbaijan University of Cooperatives. She has been a public and political activist since 2011. In 2011-2013 she participated at regional and national level events and gained various awards at the S. P. Pishavari humanitarian school gymnasium. She is Deputy Chairman of the Student Youth Organization of the organization she has been studying since 2014. He has been the organizer and participant of many events in Baku and the Republic. He was awarded twice by the Ministry of Youth and Sports of the Republic of Azerbaijan for his active participation in the implementation of the State Youth Policy in the country. In general, public and political activities were honored by the relevant government agencies and non-governmental organizations with 11 honorary diplomas, 5 diplomas and 3 certificates. Since 2013 he has been an active member of the New Azerbaijan Party and the New Azerbaijan Party Youth Union. He is the author of 2 scientific articles. She has been involved in IT, Networking, Designer, Web Developer, Computer Engineering seminars and courses since 2015 and has gained a wide range of knowledge. From September 2017 to September 2018 he worked as the Head of Information and Communication Technologies Department of Azerbaijan University of Cooperatives, and since September 2018 he is the Head of the Department. The university’s access to the international information network is ensured by its joining the Internet. For this purpose, the Department of Information and Communication Technologies was established at the University in 2012. The ICT division provides access to information technology in the University, the integrated electronic network system, and access to the international network. Access to the international information network by the University enabled the students, the faculty and other staff to receive international scientific conferences, symposia, and scientific research information. International and foreign correspondence at the university, access to information, e-signature, international research and exchange of books have been made possible through this system. Web sites, e-mails and addresses of the university and individual structural divisions provide an opportunity to get operational information in the international arena. The University’s access to the international information network positively affects students ‘and employees’ access to international experiences and outlook. All structural units, including libraries, reading rooms, have modern computing technologies. There are 161 computers connected to the Internet in the use of students. The exchange of books, the educational and scientific work of the employees are widely used by the Internet network. The ICT department of the University is engaged in supplying cabinets, labs and auditoriums with modern electronic media. The professor-teacher staff uses the electronic system to write textbooks, textbooks and articles, as well as to write a magistr. The university has been permanently connected to the Internet and students, teachers and other employees use these opportunities to organize the learning process.